A new study, published in the journal Lancet Infectious Disease, has found that a new Ebola vaccine can generate a strong immune response in patients. During a clinical trial of the ChAd3-EBO-Z vaccine, the researchers found that the injection was well tolerated and it is hoped that it could provide a better solution for stunting transmission should another epidemic break out. If the vaccine can be determined to be safe and effective, it could help stop more people being exposed to the bloodborne pathogen that infects them with the virus. As it triggers a strong immune system response, it could be valuable for people who are at a high risk of contracting the virus, like neighbours, partners, family and friends of those who have been diagnosed with the infection. 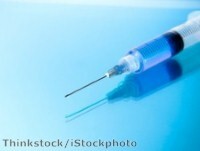 Bigger trials of the vaccine have now begun to see whether or not it is safe. The research say that if these larger studies support the initial findings, the vaccine could become a tool to interrupt transmission in future outbreaks. The research, which was carried out in Mali in West Africa and Baltimore in the US, included the first testing of this vaccine in adult healthcare workers and other at-risk persons in Africa. It found an appropriate dose for injections, which will be used in subsequent clinical trials and for large-scale manufacture of the vaccine. The vaccine consists of a modified cold virus or adenovirus so that it doesn't cause any illness and is unable to multiply. Among the cold virus is a single Ebola protein, which is detected by the immune system and then protects the body from it. The study was the result of a consortium of the World Health Organization (WHO), with support from other groups such as Oxford University's Jenner Institute and manufacturer GSK Biologicals. As part of their research, the investigators found that the positive effects could be improved by combining the vaccine with a booster. This "prime-boost" approach provides a way to vaccinate healthcare workers and other front-line workers who live in areas where Ebola poses a threat to re-emerge and who need prior enduring protection. Dr Myron M. Levine, associate dean for global health, vaccinology and infectious diseases at the University of Maryland School of Medicine (UM SOM) and part of the research team, said this was a crucial step in developing the vaccine. He explained: "This gives us essential information that the vaccine is not only well-tolerated but the high dose stimulates strong immune responses in adults in West Africa, the global region where the Ebola outbreak was rampant last year." During the study, the team compared the clinical acceptability and immune responses of 20 adult participants in Baltimore and 91 in Mali. Each group was given different dosage levels of vaccine and the researchers established that there were no safety concerns, recommending that further studies are conducted. "Ebola remains an urgent international public health problem. Dr Levine and the CVD team have done excellent work with this study. It will give us crucial data that will eventually help those who are on the front lines of the fight against Ebola," says UM SOM dean Dr E. Albert Reece.